If you haven't been reading this blog it may come as a surprise to you (as many things will come as a surprise to you if you don't read blogs on topics that interest you because they are, it must be said, often ahead of the news curve) that the future of www.iht.com is not looking so rosy. Before I bring you up to speed on the slow speed MSM's coverage of this story, I thought it would be nice to first of all remember all that I LOVE about www.iht.com. I very much hope something better will come next March; I wish all those involved into rolling www.iht.com into www.nytimes.com the very best, but I for one will miss it if the new offering (essentially the international news pages of www.nytimes.com, although how they handle the U.S.A in that light will be interesting) isn't at least as good. And I still maintain that for the sophisticated Net savvy European, www.nytimes.com looks like a retro-joke/bottle of split ink. Typesites is a weekly look at sites that have great typographic design. The International Herald Tribune, like The New Yorker (reviewed previously on Typesites), is a print publication with a reputation for good design in the print world; trying to make the same magic happen online. One thing that immediately sets the IHT apart from most other print newspapers’ websites (including that of its parent company the New York Times) is that the IHT doesn’t seem as much to be trying to look like a newspaper. It employs tasteful gradients, drop-shadows, et cetera; which creates a look similar to a news website, rather than a newspaper who has a website. I especially love how the two typefaces on the site play off of each other. Arial is a very neutral, clean typeface. Georgia, on the other hand, has a lot of character, and is probably the best thing to happen to web typography as of yet. However, it’s been used so much lately, and has so much character on it’s own, that it quickly becomes overwhelming if used without moderation. However, the design manages to keep a great balance between the clean and the character. The same goes for the color scheme. The muted blue and grey are as clean as any Helvetica-ripoff. And they, too, are very well contrasted by the warm yellow text elements spread throughout the design. The use of borders on the site is another astonishingly well-performed balancing act. Like Georgia, borders can either make or break a design — and in this case they definitely make it. From the delicate dotted lines in the byline to the concise 1px border around the article to the thick, light gray border of other content boxes—they all work wonderfully with each other. My personal favorite is the thin gray border around the article images. Not quite large or defined enough to be noticed, but enough to help bring out the image. The body copy is set in a very straight-forward 13px Arial with a line-height of 18px (about 140%), ragged right. The leading does a very good job at making the text readable without going to extremes. You can even choose a three-column view, which shortens the line-lengths a little and makes reading long stories on screen a more pleasant experience. It should also be said that the site has some of the cleanest code I’ve seen on an online newspaper site. The design is not without its faults, though. Firstly, as a result of the IHT trying to take full advantage of the web, the different parts of the site seems to suffer from what I like to call “Restless Website Syndrome”. This occurs when a site pulls content in from an external site, with all the stylistic baggage that the widget brings on. Much of the elegance of the design is ruined by dragging in things like the differently-styled Reuters-box on the front page. Another example is the (awesome as it may be) function that allows you to click the name of the city from where the story was filed and in turn will launch a Google map and provide you with links to other stories from that city. The problem is that the Google map looks awkwardly out of place in the design; what was a good idea on paper, suddenly becomes a visual problem. Not only that, but the site overall seems to have too many elements that weren’t fully thought through. The blog section of the site, for instance, still looks a little unfinished to me. The navigation also captures this unfinished feel, in my opinion. The thick top border looks a little out of place and the three bars, while I see what they are trying to do, remind me of a poorly compressed JPEG. There are also some minor issues that bug me a little. One of the good things about the standardized RSS-icon is that it can be colored any way you wish. So why did the IHT go for one that clashes so utterly with the warm yellow accent-color? Then there are the uglies in the body copy itself, such as improper quotation marks and orphans. I’d personally like just a little tighter spacing between the paragraphs to make it a little less blocky. The design overall doesn’t seem to have as much flexibility as, say, the New York Times website. Overall, the Int’l Herald Tribune has dared do go in a different direction than most other online newspapers, and it has ended up in an elegant and well-functioning design. However, it seems the fusion of a 121 year old newspaper with Web 2.0 may have been a bit of a challenge. What works on the site works well, and what doesn’t looks cheap and unfinished. It may be nostalgia, but to me, the old IHT-design (without the drop shadows and gradients, but with the same content) worked better. Perhaps sometimes you can have new function, without the new style. John Arnor G. Lom is a web- & graphic designer and freelance superhero from Norway. He can be found in his online hideout at Twisted Intellect, as well as on Twitter. It is a fairly fluctuating design, really. Some areas look like serious thought and consideration were put into creating them while others look like they were just thrown in after the design was completed. That said, the type throughout the site is done beautifully and should be commended. I agree with most of what you said concerning the widgets seeming out of place. They make a solid effort to flow with the rest of the site, but they come up a little short. Removing or recoloring the Reuters header would eliminate some of that tension. Here is where I tend to disagree. Other than a well-styled navigation, it doesn’t really set itself apart much to me. It looks like a mix of the ten news sites I read each day. I’ve never seen this particular website before, yet instantly there was an air of familiarity about the design. I don’t think this is much of a coincidence; the design works so why take a chance and do something completely original, possibly compromising their reader-base. Overall, it has a nice design that I’ve seen before on other sites. It does, however, do a better job in typography than most websites belonging to newspapers. Kevin: I see your point. What I meant by that is that the design is more ‘online design’ than ‘print design ported to the web’. If you look at sites like the New York Times, the New Yorker et cetera; it looks more like the paper newspaper design, than what this design does. You’re right that the design isn’t radically different; though. That just makes it even more impressive to me when it is able to make a mark, just on the basis of good type. As a whole I think the IHT works pretty well. There are, however, quite a few issues I take with the entire site. Layout-wise, I don’t think the columns are structured well. They could have used a better grid and structured the content around equally sized columns. HOWEVER, despite this fact they still managed to make the content look aesthetically appealing and also easy to read. I love their use of regular Georgia for the headlines. The headlines used on the IHT are much easier to read than those on the New York Times website, which are set in bold. Also, the body copy set in Arial is a great choice, which is also easy to read and contrasts beautifully with the serif headlines. Detail-wise, I have a few complements and a few issues. I typically dislike the use of gradients. They seem fairly useless to me. The same goes for the IHT. The few gradients I see completely throw off the design, in my opinion. They seem out of place. Solid colors in place of the gradients would not only look better, but also cut down on the size of the page itself. The use of borders on the site is another astonishingly well-performed balancing act. I completely agree. Where the designers could have simply filled content into their respective places, the addition of borders REALLY helps to separate the various types of content. Another detail I noticed, and like very much, is the Market Tools section (about 1/2 to 3/4 of the way down). Not only is the search bar (used to search different stock symbols) big, so is the GO button. It’s extremely easy to use. And when you press go, you’re taken to a very elegantly laid out stock market page with nice infographics and easy to read stock information. @John: Thanks for the clarification, don’t worry I didn’t notice any of the grammatical errors first time around ;). I did see the A List Apart article when it was published, still seems quite a task to get the right map tiles. Hopefully there will be a few more map APIs coming out that will offer the stability and coverage of Google maps with the ability to fully customise. 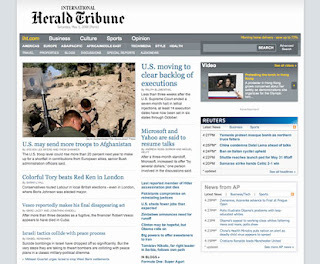 By the way, I found an old screenshot of IHT before the redesign. And seeing it again, I do think much of my affection is indeed nostalgia-related. I am glad to see the pinstripes, pixel fonts and dotted border extravaganza go. Does internet advertising piss people off? Think. Again. About perspective too. What exactly are NYT blogs?